Keeping your dog’s water bowl clean can be a challenge. Most dog owners are not aware about the importance of keeping their pooch’s water bowl clean. The fact is, the water bowl can be an ideal source for bacteria formation, which can easily affect your dog’s health. Lots of dog owners do not really care about the importance of keeping their dog’s water bowl clean. Since its just water, they feel that the do not have to stress about the cleanliness of the bowl or they have a perception that it’s always clean. However, this is a false perception, as a dog owner, you need to understand the importance of keeping your pooch’s bowl clean. Dogs do have a affinity to dirty water. This might sound strange, but it is true. The dirtier or smellier the water, your dog is easily attracted. You should know that drinking dirty water makes your dog vulnerable to several diseases. Even though most of these diseases are not really caused due to drinking water from the bowl at home, there are many ways of these getting to your dog. For instance, Pythiosis, known as swamp cancer is caused from drinking still water from ponds or any similar source. If your let your dog to drink water from a common bowl, your pooch can indirectly get affected from other dogs who have consumed water from a still source and then from the common drinking bowl. It is mandatory that you clean your pooch’s water bowl every day. If your dog prefers multiple water stations, ensure that you change the water and clean the bowl on a frequent basis. Irregular cleaning of the drinking bowls can lead to the formation of biofilm. Biofilm is a thick slimy formation in the bowl, which is known to harbor bacteria and other disease causing pathogens. Biofilm if left untreated for long can cause health concerns like salmonella, enteritis, diarrhea and gum disease. It is ideal to clean the water bowls with hot water and soapy solution. Leaving the bowls in hot water can help to remove the biofilm easily and effectively. 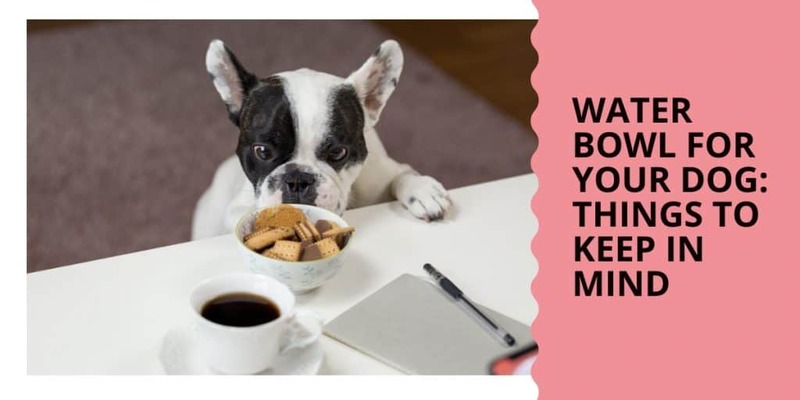 Choosing the right bowl for your dog is also an influential factor when it comes to keeping it clean and preventing health concerns. Plastic bowls are not advised by most of the professionals as they might have cancer causing materials like BPA. Cleaning plastic bowls with hot water can also be a risk. Therefore, if you decide to stick with a plastic bowl, ensure that you do not go for a cheap option. Stainless steel bowls are the recommended choice when it comes to choosing a water bowl for your dog. They are easy to clean and do not cause any reaction with any form of cleaning solution. It is better not to allow your dog to drink from any of the friendly common bowls for pets that you see in shopping malls or similar establishments. Always make sure that he has access to fresh source of water. What happens when you leave a short-nosed dog in a locked car?